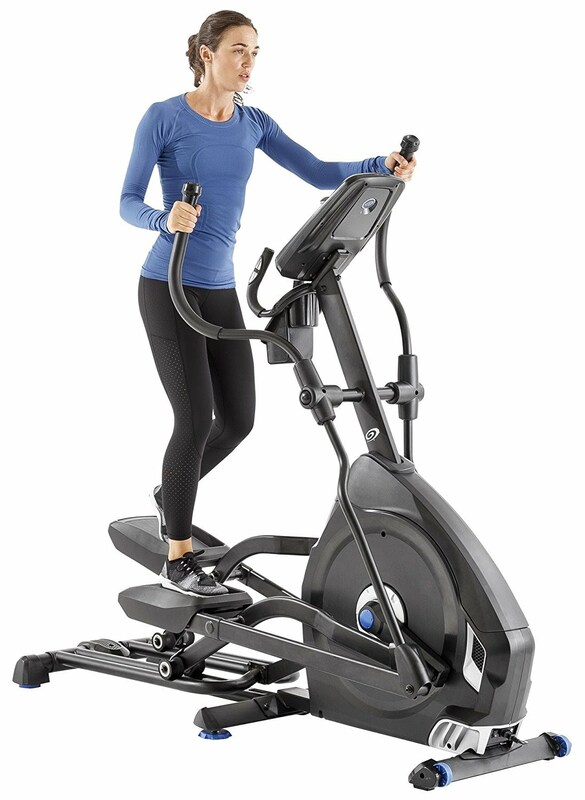 The Nautilus E616 Elliptical Trainer MY18 2018 retains all the high-end features of the previous 2014 model but with an updated console that’s designed to be more user-friendly for ease of use, a new dual-rail system for more stable and smoother operation, along with an all black design for a sleeker look. The Nautilus E616 Elliptical Trainer MY18 is Nautilus’ premium model over the E614 and offers a wide range of features to keep you motivated along with a sturdily built machine that allows for up to 300 lb user weight capacity. 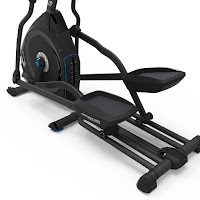 The Nautilus E616 Elliptical Trainer 2018 utilizes a front-drive system with a high-speed high-inertia perimeter weighted flywheel together with an Eddy Current resistance system that combine to provide smooth and quiet operation throughout the wide range of programs (29) and resistance levels (25). Ergonomically designed, the Nautilus E616 Elliptical Trainer features a 20” Precision Path stride length and large articulating footplates with cushioning for a comfortable workout. The E616 MY18 utilizes a new dual rail system for increased stability and smoother operation. Besides the 29 programs and 25 ECB resistance levels, the Nautilus E616 Elliptical Trainer also offers a 0-11% motorized incline for additional challenge and to work more muscle groups. Workout programs include profile, heart-rate, user profiles, fitness test, recover test, and Quick Start. The Nautilus E616 MY18’s newly designed console features Dual Track blue backlit LCD screens (2) and displays up to 13 workout stats to keep you motivated including time, speed, distance, calories and heart rate. 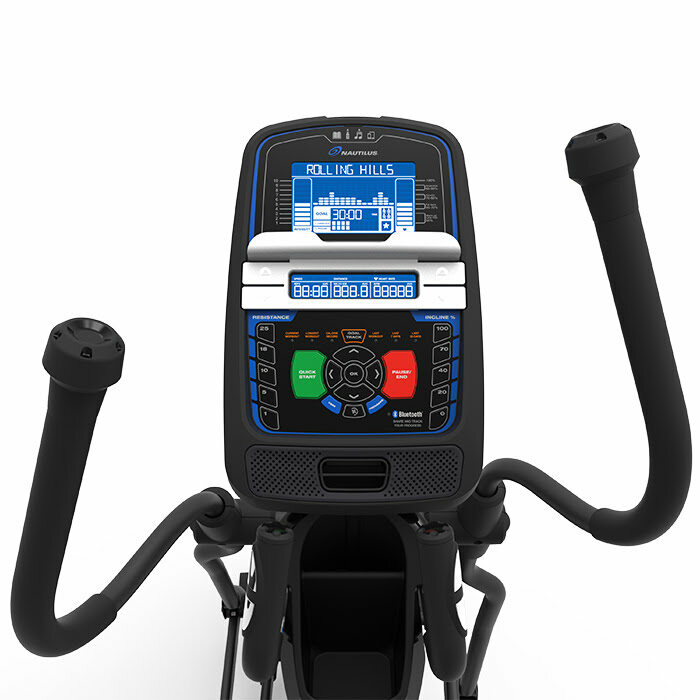 The Nautilus E616 allows for up to 4 user profiles so 4 different people can use the elliptical machine on a regular basis and keep track of their workout stats. In addition, the E616’s console is Bluetooth enabled so you can seamlessly transfer your data to online fitness tracking apps like Nautilus Connect, MyFitnessPal and more. Additional features of the Nautilus E616’s console include a charging USB port, acoustic chambered speaker with MP3 input, adjustable 3-speed cooling fan, and built-in media shelf (a tablet or book placed on the shelf will only cover 1 window so you can still see your workout stats on the 2nd window). There’s also a conveniently placed water bottle holder located underneath the console so you can keep hydrated as you exercise. The Nautilus E616 MY18 Elliptical Trainer offers both contact pulse (sensors in static handlebars) and telemetry heart-rate monitoring (for wireless chest strap) so you can ensure you stay within your target heart-rate zone as you exercise. The Nautilus E616 Elliptical Trainer MY18 2018 is well-constructed and designed with integrated levellers and center-frame supports for added stability. This elliptical machine also features front-mounted transport wheels for ease of relocation. The Nautilus E616 Elliptical Trainer MY18 is well-constructed and packed with features to keep your workouts varied and challenging and rivals many elliptical trainers in the higher / more expensive categories. There are plenty of options to keep your workouts varied, challenging and motivating along with premium features to keep you entertained as you exercise – you can listen to your favorite music via the built-in speakers and MP3 port or place your mobile device or book on the media shelf – the time will fly by! 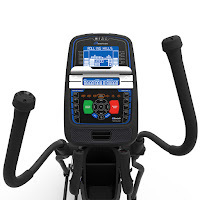 Besides the quality of build construction, other premium features on the Nautilus E616 which are not typically found on lower priced elliptical trainers include the motorized incline (many elliptical machines don’t have an incline feature at all), dual blue backlit screens (many elliptical machines only have one black/grey screen), 20” stride length (many elliptical trainers have a shorter stride length), Bluetooth connectivity, USB port, sound system and cooling fan. So you really are getting great value for money with this machine! Elliptical trainers in general offer an effective total body workout that combines moving handlebars to work your upper body and footplates to work your lower body. And the good news is that elliptical trainers are low-impact which means working out on them is easier on your joints compared to many other types of exercise.